A few weeks ago my boyfriend came up with a great chicken and red cabbage sandwich idea with an orange infused olive oil. He brushed the inside of the bread with this flavoured oil that we created by heating up a dish of olive oil and orange peel in the oven. The aromatic oil was wonderfully flavoured but the crisp citrus peel impressed me just as much! Since then I’ve used roast lemon and orange peel for my pasta, salads, couscous and risottos. The thin strips just need a few minutes to become golden crisps packed with flavour so it’s important to take them out at the right moment. If you leave them in the oven for too long, they become bitter, and this can happen within seconds! 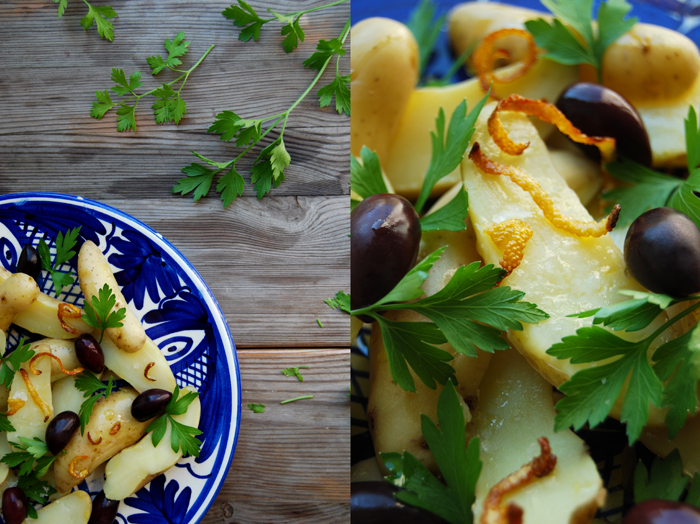 I have many ideas in my head that feature both the wonderful oil and the crunchy strips, today’s recipe combines roast lemon peel with potatoes, parsley and black olives to make a warm salad, great for lunch or as a side dish. 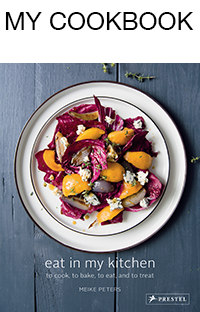 I use the lemon flavoured olive oil as a dressing and the peel as a crunchy topping. It just needed some flaky sea salt for seasoning and it was done! 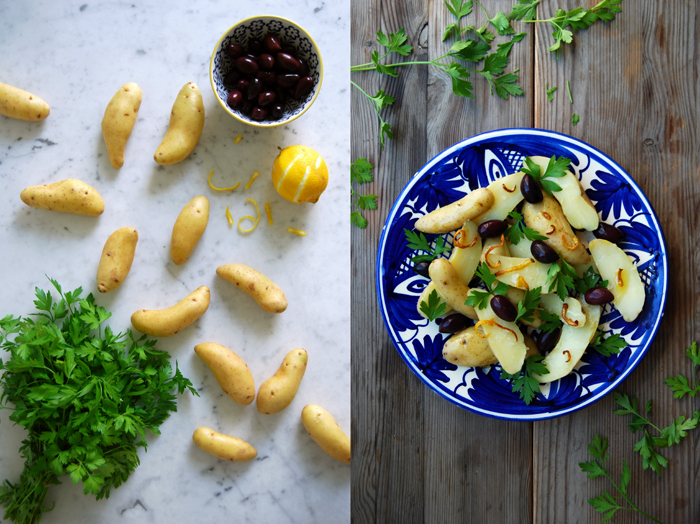 I often use the French La Ratte potatoes for for these kind of potato salads, their taste is nutty and buttery and the skin is very thin. I don’t even peel them, I just clean them with a vegetable brush and cut them in half when they are cooked. Set the oven to 200°C / 390°F (fan-asssited oven). 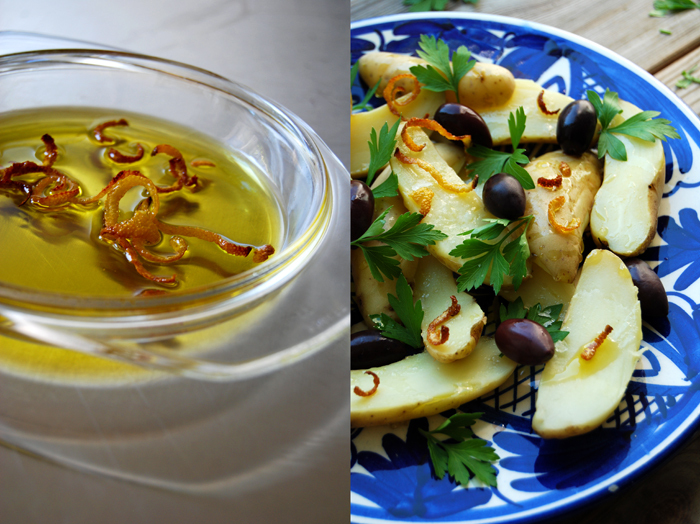 Put the olive oil and lemon peel in a baking dish and cook for 6 minutes or until the peel is golden and crisp. 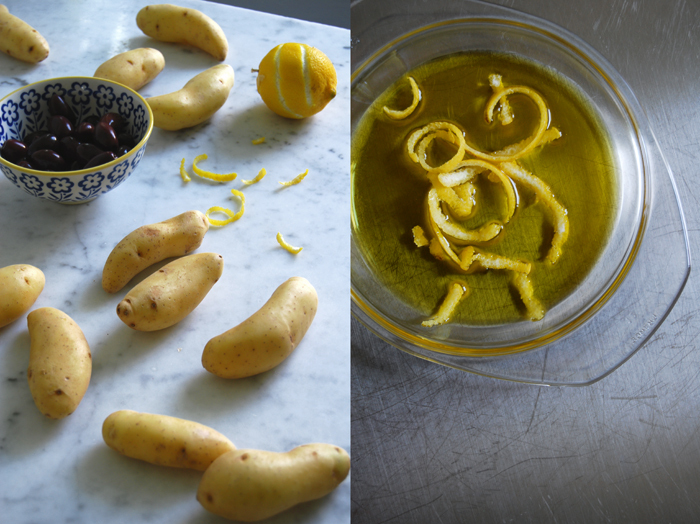 Spread the potatoes on plates and mix them with the lemon infused olive oil. 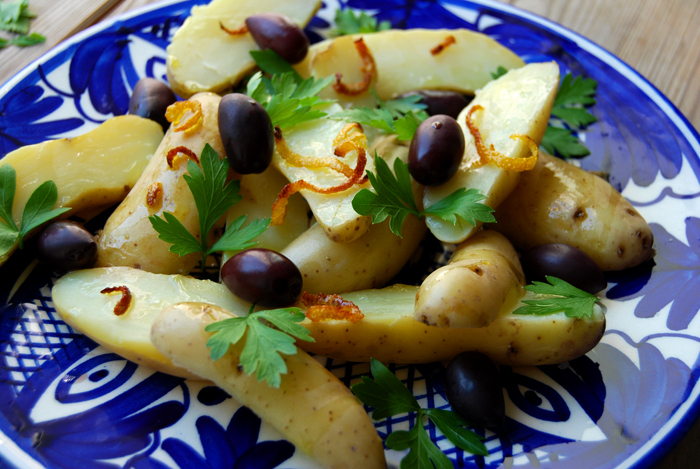 Sprinkle them with parsley, olives, roast lemon peel and salt and serve either warm or cold.